There’s a reason some things become holiday traditions – whether it is Mom breaking out that classic Mario Lanza Christmas album or Great-Aunt Enid sending one of the fermented fruitcakes she baked sometime last winter. 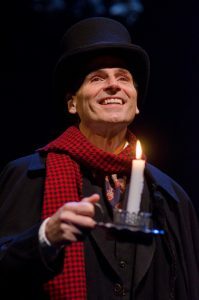 For almost a decade, the Olney Theatre Center has offered local theatre-goers an enjoyable holiday treat in the person of actor Paul Morella and his one-man show, A Christmas Carol: A Ghost of a Story. For the uninitiated, Ghost is a plenteous hot plum pudding to go along with your Christmas goose and all of the trimmings. We reviewed this show two seasons ago, but we were drawn to return twice despite our minor qualms with Morella’s performance. The accents come and go at times, and the prop play seems a little much. There is also a degree of affectation with Morella’s many characterizations. None of this is surprising or terrible – it is simply the nature of a one-man show. What makes Morella’s performance so endearing is he conveys the time-honored magic of listening to Dad telling the young (and young at heart) a bedtime story! Never mind the mix of accents and cartoon voices. Our dads used to do the same thing. And with Morella’s animated presentation, we are allowed to let our imaginations run wild. In the actor’s hands, a carefully held footstool becomes an eagerly awaited Christmas goose. A cane becomes the bow for a phantom violin; a greatcoat becomes the menacing cloak of the Ghost of Christmas Yet to Come. But our imaginations aren’t the only thing running wild, as we sit transfixed in the darkened theatre. Morella springs about the stage with the energy of a miraculously cured Tiny Tim. Forget about the crutch – Morella relies almost entirely on Dickens’ novella to spin this highly entertaining theatrical tale. The wreck of a set – with an over-flowing desk, several half-burned candles, a beat-up antique chair for a bed, and a bowl of yesterday’s gruel – may also be a quaint reminder of our childhood. Or our adulthood! But it works exceedingly well in helping Morella sell the beloved story. There are laughs, of course, and a few gasps, as Morella’s makeup and the lighting convey ghastly apparitions. But there is nothing about the show that makes it less than desirable as family fare. At this time of year, dramatic and cinematic versions of A Christmas Carol abound. Many are fine and quite enjoyable, though I’ve often wondered why George C. Scott didn’t just slap the ghost of Jacob Marley and send him back to the front (OK – that was a gratuitous Patton joke.) Still, Morella’s presentation is unique and worth a hearty recommend. It may even be said that Morella knows how to keep Christmas well, if any man alive possesses that knowledge. Who knows? It may just become your newest holiday tradition! A Christmas Carol: A Ghost of a Story, runs now – December 30 in the Mulitz-Gudelsky Theatre Lab of the Olney Theatre Center. Running time is about two hours with one fifteen minute intermission. The theatre is located at 2001 Olney Sandy Spring Rd, Olney, MD 20832. For tickets or more information, visit Olney Theatre Center. Also playing at Olney this Christmas is Elf: The Musical. Elf runs now – January 6, 2019. For tickets or more information about Elf: The Musical, visit Olney Theatre Center.